Synthetic peptide within Rat EAAT2 aa 550 to the C-terminus (C terminal) conjugated to keyhole limpet haemocyanin. The exact sequence is proprietary. WB: Mouse and rat brain tissue lysates. 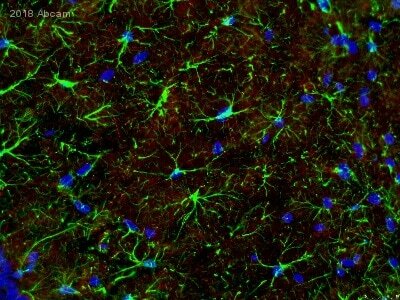 IHC-Fr: Mouse brain tissue. ICC/IF: PC-12 cells. Our Abpromise guarantee covers the use of ab41621 in the following tested applications. Immunohistochemistry (Frozen sections) - Anti-EAAT2 antibody (ab41621)This image is courtesy of an Abreview submitted by Daniel Berg. 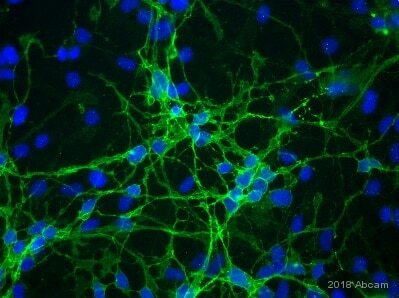 Immunohistochemical staining of PFA-fixed, frozen mouse brain tissue using undiluted ab41621. Tissue sections were permeabilized using Triton-X100 and incubated with ab41621 for 12 hours at 4°C. 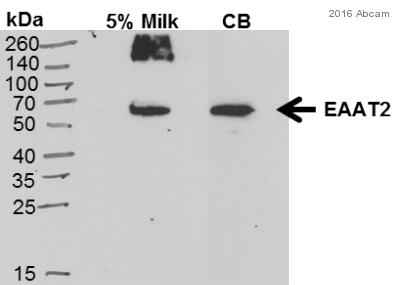 ab150077 (goat anti-rabbit IgG H&L Alexa Fluor® 488) was used as the secondary antibody. Methanol fixed human astrocytes (differentiated from H9-derived neuronal) cells labeling EAAT2 using ab41621 at a 1/250 dilution, 1 hr, 22°C (green) followed by an Alexa Fluor® 488 secondary antibody (1/1000 dilution), in ICC/IF. Cells were blocked in 5% BSA for 30 mins, 22°C. ICC/IF image of ab41621 stained PC-12 (rat adrenal gland pheochromocytoma cell line) cells. The cells were fixed in 4% formaldehyde (10 minutes) and then incubated in 1% BSA / 10% normal goat serum / 0.3M glycine in 0.1% PBS-Tween for 1 hour to permeabilize the cells and block non-specific protein-protein interactions. The cells were then incubated with the antibody (ab41621, 5 µg/ml) overnight at +4°C. 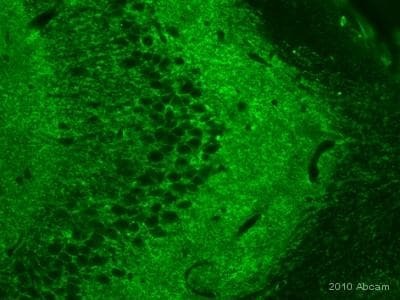 The secondary antibody (green) was ab96899, DyLight® 488 goat anti-rabbit IgG (H+L) used at a 1/250 dilution for 1 hour. Alexa Fluor® 594 WGA was used to label plasma membranes (red) at a 1/200 dilution for 1 hour. DAPI was used to stain the cell nuclei (blue) at a concentration of 1.43 µM.